Updated 8:45 p.m. | The sounds of military cannons rattled the Capitol Rotunda on Monday. Over and over. Twenty-one somber times as Congress paused to welcome former President George H.W. Bush for the final time. With votes set aside in both chambers, Republican and Democratic members gathered in the ornate room under the building’s signature dome, black bunting adorning its doorways. The 41st commander in chief’s eldest son, former President George W. Bush, sat feet from his father’s casket, looking skyward several times and blinking rapidly, appearing to fight back tears. He seemed touched more than once as congressional leaders and Vice President Mike Pence hailed his father as a “great man” and a “hero” and a “patriot” who was a “devoted husband” and principled leader. The late president was hailed for reaching across the political aisle, even as Democratic lawmakers and GOP President Donald Trump are readying for a fight over a spending measure that the latter insists must include $5 billion for his southern border wall project. But for one afternoon, Republicans chatted with Democrats in the Rotunda. Two longtime adversaries — the 43rd president and Senate Minority Leader Charles E. Schumer — shared a quiet word and a mutual chuckle as the New York Democrat greeted each of George H.W. Bush’s children. There was a common theme embedded in the remarks of those who spoke. They honored Bush for his repeated decisions to serve his country, first as an 18-year-old who volunteered to fight in World War II, a calling that later led him to Congress, then to the United Nations, to China, then to Langley, and finally to the Oval Office. “A steady hand, staying the course. That’s what George Bush gave us for decades. Decorated aviator. Congressman. Ambassador to the United Nations. Envoy to China. CIA Director. Eight years as vice president and four as commander-in-chief. Through the Cold War and the Soviet Union’s collapse, he kept us on course. When the rule of law needed defending in the Persian Gulf, he kept us on course,” Senate Majority Leader Mitch McConnell said. The 43rd president let out his signature chuckle and leaned toward his brother, former Florida Gov. Jeb Bush, to exchange a brief comment as Ryan recalled their father’s 1988 presidential campaign, which Ryan supported while in college. A military honor guard carefully carried Bush’s American flag-draped casket into the Rotunda and placed it on the Lincoln catafalque, the same platform built and used during the funeral of Abraham Lincoln after the 16th president was shot dead. The honor guard soon moved into position around the casket, over which it will keep watch as the public and dignitaries pay their respects. Members of the House and Senate — from both parties — lined up behind a red velvet rope to mourn. Seven of the nine Supreme Court justices stood together on the east side of the ornate room, with several Trump administration Cabinet members, including Defense Secretary James Mattis, Treasury Secretary Steven Mnuchin, Commerce Secretary Wilbur Ross and Interior Secretary Ryan Zinke. White House Chief of Staff John F. Kelly stood behind D.C. Mayor Muriel Bowser. Among the notable figures who entered just minutes before the casket and Bush family were James Baker, who was secretary of State under Bush, and Colin Powell, chairman of the Joint Chiefs of Staff during the first Gulf War under Bush. They were among a group of the late president’s former Cabinet officials and aides, along with friends — some were both — who greeted his casket as it was carried up the steep Capitol stairs. A military band played “Hail to the Chief” on the East Front driveway before the stairway climb. A Navy sailor carrying a dark blue flag with the seal of the office of the presidency followed a few steps behind. The 41st president died Friday night in Houston. He had long battled a form of Parkinson’s disease and had been wheelchair-bound for years. Members of both parties have praised his decades of public service, from naval aviator to congressman to director of central intelligence to commander in chief. Bush will lie in state in the Rotunda until Wednesday morning, when his casket will be transported through the streets of the capital city to the National Cathedral for his state funeral service. Among those who will eulogize him is his son George W. Bush. In a television interview that aired Sunday evening, the 43rd chief executive predicted his father will one day be regarded as the “greatest one-term president” in American history. Bush’s 58 combat missions in World War II would have been “enough honor” for most, but Bush “was just getting started.” When Bush left office in early 1993, “he left America and the world more peaceful, prosperous and secure. He was a great leader who made a great difference in the life of this nation,” the vice president said. He also recalled a note Bush wrote his son Michael, a Marine aviator, after he reached a milestone in his military career. The former Navy pilot wrote Michael Pence that he wished him “many days of CAVU,” a military acronym that stands for “ceiling and visibility unlimited” — a pilot’s dream. Minutes later, McConnell and Senate Minority Leader Charles E. Schumer, followed by Ryan and House Minority Leader Nancy Pelosi then Pence and second lady Karen Pence bowed their heads as service members moved arrangements of red, white and blue flowers into place around the casket. As House members moved around the round room, some dabbed away tears. More than a few stood together in small groups and prayed. Later in the day, around 7:30 p.m., the Rotunda opened briefly to the public. But it was quickly cleared again when Trump and the first lady arrived. 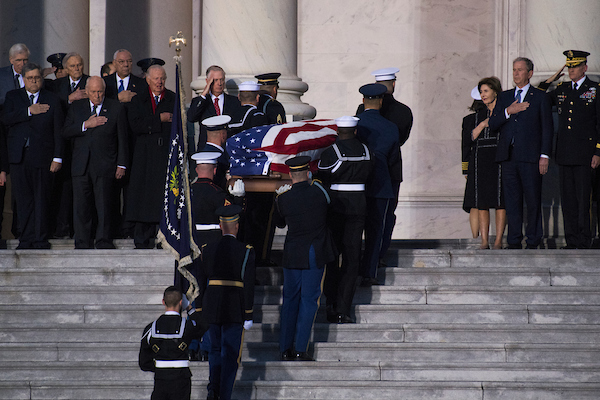 Escorted by the sergeants at arms of the House and Senate, the couple entered the Rotunda and approached the flag-draped casket together, with the current president saluting Bush. At the same time, the first lady placed her hand over her heart. Patrick Kelley and Niels Lesniewski contributed to this report.